Mount Richmond Forest Park is just south-east of Nelson, to the extent that it’s feasible to walk out almost directly into Nelson if you arrange your trip that way. This is where we headed for the long Queens’ Birthday weekend. 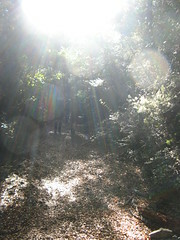 Location: Mount Richmond Forest Park, Hackett Road End to Brook Street Exit. People: Éamonn, Paul, Sharon, Fiona, Steven and me. Huts visited: Hackett Hut (1 night), Browning Hut (0 nights), Roebuck Hut (1 night), Middy Hut (0 nights), Rocks Hut (1 night), Dun Hut (0 nights), Third House Shelter (0 nights). Route: Hackett Road End to Hackett Hut for Friday night (actually for Saturday morning to be more accurate), then on to Roebuck Hut for Saturday night via Browning Hut and Totara Saddle. 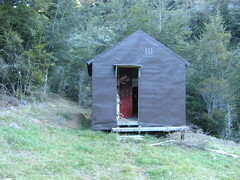 Carry on along the Pelorus River to Rocks Hut for Sunday night, with a short side-trip down to Middy Hut on the way. Then out to Brook Street, including a side-trip up Dun Mountain from Dun Saddle. After a late ferry crossing, which didn’t leave Wellington until about 7pm, we were finally dropped at the Hackett Road End of Richmond Forest Park at about 1am. We’d shared the shuttle with another group from the club (Craig’s group), and they’d already planned to set up camp at the end of the road. Somehow in our group, we’d reached a vastly superior consensus to start walking. After a few minutes of preparation (admittedly mostly myself getting my things sorted), we set off for what was a 90+ minute walk towards Hackett Hut. We arrived at Hackett shortly before 3am on Saturday morning, with only Sharon’s torch having exhausted its original set of batteries. Five people were already soundly asleep in the six bunk hut, and wanting to make minimal impact we decided to avoid cramming all of us in. Éamonn and Steven set up Éamonn’s tent outside. I thought about setting up my Huntech fly, but eventually decided it’d be just as easy to clear a space in the wood-shed outside. Paul, Sharon and Fiona, meanwhile, snuck inside and quietly settled down in the hut. I was later told that the 5 existing occupants showed no signs whatsoever of being woken. It was a cold night outside under a clear sky. I think my own sleeping bag was near its limits, and throughout the night I added a few extra layers to keep warm. Waking to the chirping birds at about 6.30am, on the back of 3.5 hours of sleep, it turned out to be a very frosty morning. For myself at least, I couldn’t really get back to sleep by that point, so I basically sat and watched the morning emerge. Smoke began emerging from the hut a little after 7, indicating that someone was awake, and I eventually ran into a couple of members of the 5 person family (as it turned out) who’d been asleep in the hut. There was still a while to wait before anyone from my own party emerged, and during this time that I noticed three young deer bounce through the frost down the path from somewhere behind the long drop. They ignored me as I gazed from the wood-shed, paused for several seconds, and then continued their bouncing around the corner and up the track towards Browning Hut. Not having been very patient in the past this is the first time I’d ever seen deer in this situation, and I found it fascinating. Meanwhile the youngest two of the overnight family were having a great time running around inside once they’d awoken. It wasn’t before Paul, Sharon and Fiona evacuated into the outside frost. Éamonn and Steve finally hauled themselves out of Éamonn’s tent at about 8, and everyone finally began preparing breakfast and getting ready to leave, except for me because I’d had mine up to an hour or so beforehand. It was quite nice to just sit in the shed and watch the first glint of the sunshine come up over the hill, before quickly getting out of the way as the frost on the roof immediately began to melt and started dripping through the rusty corrugated iron roof onto the floor below. It wasn’t until 10am before we finally left. I think the late start was a consequence of us having arrived so late, yet it was a bit disconcerting that somehow I’d still only gotten a few hours of sleep. It probably hadn’t been my best decision ever to have set myself up in the wood-shed, particularly when strictly speaking there would have still been space on the floor inside, but that was okay. Much of the track was covered in frost, with it not yet having been reached by the sunshine. It took us a little over an hour to reach Browning Hut, at 11.10am or so. Nobody was home although a couple of people had left their gear in the hut and gone out somewhere. We sat down for a while in the clearing outside, having various arguments about approaches to the scientific method and listening to Éamonn explaining Irish legends. 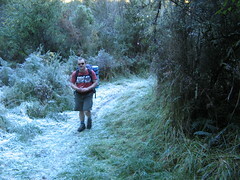 The first, and only real climb of the day, took us up from Browning Hut to Totara Saddle. It’s about 1 km horizontally rising from about 480 metres to 680 metres (which I guess is an average 1:5 gradient), and it took us about 25 minutes. The saddle has a junction from which it’s possible to go directly to Rocks Hut. We’d considered this as an option because the track also looks as if it gets above the bush-line, at least for a short distance. Ultimately we decided against the short-cut, though, because it would have left us without much to do for all of Sunday. Instead, we headed towards Roebuck Hut, along the ridge to the east. It’s almost certainly the lack of sleep talking, but this was probably one of the less interesting 6.5 kilometres of track that I’ve ever walked. It’s not a bad track, but there’s also not much variety. The track doesn’t even follow the top of the ridge. Rather, for some reason of which we were unsure, it sidles and sidles and sidles almost the entire distance. Even though the LINZ map (including the 2006 edition) indicates that the track begins to follow the top of the ridge after about 2/3 of the distance, this is a blatant lie. We did reach the ridge-line for a brief moment, after which the track took us straight back down for even more sidling. There were a couple of large fallen trees around which we had to negotiate, several minor slips over which the ground looked slightly unstable, and a couple of goats that I saw running up a small spur ahead of me at some point. Apart from these, however, the most eventful part of this section was our lengthy stop for lunch at around 1.20pm. Eventually the track did begin to head north-east down the spur towards Roebuck Hut. At 3.45pm we were crossing the swing bridge near the hut, and shortly after we were there. Roebuck Hut is on the other side of quite a major swing bridge which appears to go nowhere except to that hut. This seemed quite interesting, because according to the hut’s log book, the hut doesn’t get all that many visitors. (Only a couple of groups in the past month, in any case.) Paul’s 1996 LINZ map shows an old track leading from the hut up to point 702, to the ridge that eventually leads over to Conical Knob (1216). This track isn’t indicated on my more recent 2006 LINZ map, and it seems possible that the bridge is a remnant of what used to be a much more major DOC-maintained track that used to head off that way, although now there’s a warning sign at the bottom of the track (right next to the start of it) informing people that it hasn’t been maintained since 1994, and that parts of it may no longer exist. I’m sure that wouldn’t put appropriately prepared people off taking that route, of course (as it shouldn’t), and it’d be interesting to perhaps check it out on a future trip into the area. Roebuck Hut is also in front of a really good swimming hole. It would have been even better, however, if the river or the pool had received at least a smidgen of sunshine during the entire day. I have my own belief that if I dip my fingers into water and they immediately get so cold that they feel as if they’re boiling, then it’s a good reason for me to avoid doing this to excess. My belief was not shared by Éamonn, Steven, or Fiona. Within 30 minutes of us having arrived, all three of them were eager to make their way to the swimming hole, being particularly careful not to slip on the path which was still iced over from the previous night, and then dive in and swim to the other side and back. Good for them, and they reportedly came out of it very refreshed. We had a good couscous-based dinner that evening, and for dessert we helped relieve Éamonn of many of the 1.5 kilogrammes of biscuits he’d carried in. (Yum.) Paul and Sharon then took it upon themselves to teach Eamoon and Fiona how to play the great kiwi tramping game of 500. For me, though, the lack of sleep was seriously catching up with me and I was glad to be able to nod off early and get a decent sleep. Middy Hut is another hut that’s on the far side of a large swing bridge, although the track does at least continue to somewhere else beyond the hut. Having said so though, this appeared to be another hut that wasn’t really being visited much, with only a quarter of the hut book having been filled since about 2004. 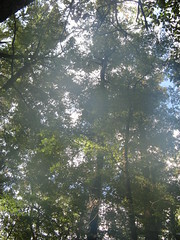 It’s situated in a great place, though, and we went down to the river to eat our lunch with the emerging sandflies. Having taken advantage of being the first person back over the lengthy 1 person at-a-time swing bridge, I was first back at the junction where the packs had been dropped at 1.20pm, and had a good chance to just sit and listen to the birds for about 10 minutes with the muted sun shining through the trees before the others arrived. for chopping at Rocks’ Hut. Nobody else was staying at Rocks Hut that evening, and once again it looked as if it wasn’t being used terribly heavily considering how well maintained it was. Our Sunday evening dinner was a curried pasta with added tuna. We could have added Salami, but Sharon and Fiona seemed to think they wouldn’t go together well for some reason and put up a very non-negotiable stance, so we decided to leave it out of the main dish. Éamonn, Steven and I added our own salami later on. And with a nice warm fire going, we settled into another game of 500, Paul and I playing against Steven and Éamonn, while Sharon and Sarah played with our superfluous milk powder and chocolate to create a concoction of chocolate milk. It rained overnight, which is (usually) the best time for it to rain. We’d only finished half of the chocolate milk by Monday morning which meant that after some re-heating, it sweetened many people’s cereal. Having waved goodbye to the flush toilets, we were away by about 9am, heading towards Dun Saddle and arriving around 30 minutes later. The arranged collection wasn’t until after 3pm, so we had heaps of time. With the weather having cleared nicely since the previous afternoon, we decided to drop our packs for a walk up to the top of Dun Mountain, about a kilometer away, except for Sharon who was keen to sit by herself at the saddle and gaze at the views for an hour. the top of Dun Mountain. On the way up Dun Mountain we reached yet another hut: Dun Hut, which sits on the flattened part of the ridge just below the main peak. 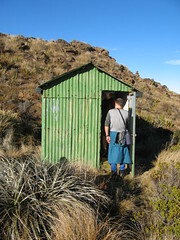 The hut is really more of a small biv, basically a tin shed with a long drop out the back. It doesn’t have any bunks although there would be space for two or three well prepared people to lie on the floor, and these days (according to DOC) it’s only intended as an emergency shelter. 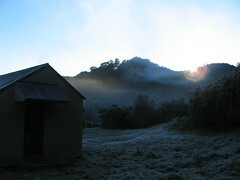 In a more practical way, however, I could imagine it being a potentially fantastic place to spend the night in expectation of a nice sunrise surrounded by the Richmond Range, the Kahurangies in the distance and the Marlborough Sounds below, all from the top of Dun Mountain, which is literally only a couple of minutes further on. We remained at the top for about 15 minutes or so before returning to Dun Saddle where Sharon was waiting, and from there we continued to Coppermine Saddle around the corner. Much of the track on this side had still seen no sunshine, and several areas were well iced over, which perhaps made it necessary to be more careful than usual. The track splits again after Coppermine Saddle at a place called Windy Peak, which we reached at 11.25am and is marked by a very obvious sign-post. There’s a choice of following a track up Wells Ridge past Wooded Peak (1111), or alternatively following a walkway which sidles around the ridge. The latter follows a less direct route on the map and although we hadn’t fully decided which route we’d take until very late, this is the one we decided on at the time. By now the atmosphere begins to become less one of wilderness and more one of a casual walkway through the trees. We met our first mountain biker before long, and soon after it became clear that it was a popular place for mountain bikes. We stopped for our final lunch of the long weekend outside Third House Hut, which is actually only a shelter, and not a hut at all as the LINZ map implies. The party of about 15 adults and young children who were picnicking outside, as well as the frequent encounters with people on mountain bikes, suggested that we were by now not at all far from a road-end. Continuing down hill to the Brook Street exit we were only once nearly knocked over by a couple of guys on bikes speeding around a corner, and those guys even spooked the people riding towards us. We reached the exit at 2.15pm, and climbing a fence into what was virtually suburban Nelson was a confusing feeling at first. With an hour to wait for the collection, we settled down and lay in the sun. 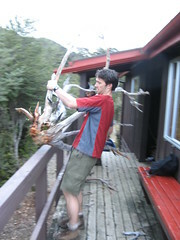 This entry was posted in tramping and tagged bagged:browning hut, bagged:dun hut, bagged:hackett hut, bagged:middy hut, bagged:rocks hut, bagged:roebuck hut, bagged:third house hut, richmond, tramping, wellington tramping and mountaineering club. Bookmark the permalink. Hi, stumbled across your site by accident when I was looking for hut photos. I can recommend the tramp from Middy Hut, up Conical Knob and then along the ‘fixed wire traverse’. At the bushline you make your way around an exposed rock ledge and up a short gully – not as bad as it sounds with the added support of the wire. From there you’re on the tops, over Mts Fell and Richmond. Hi Stephen. Thanks for the tip. I’m certainly keen to check it out next time I’m in the area if I have the opportunity. We were a bit stuck to the schedule on this occasion, I guess.